Collaboration is essential for wildfire recovery in California. Nearly 20,000 residents have been asked to evacuate their homes in Northern California as a result of the multiple wildfires that have been burning for weeks, and CNBC has reported that more than 16,000 homes have been threatened by potential damage from the wildfire at this point, leading to evacuation orders for nearly 25,000 residents. As of August 13, there are more than 17 large fires currently burning across California, including the largest wildfire on record in the state of California. Like other areas of disaster relief, wildfires, particularly in California, have becomes an increasingly common occurrence. According to a recent piece in The Atlantic (“Has Climate Change Intensified 2017’s Western Wildfires?”), the total area burned in the western United States over the last 33 years was double the size it would have been without any human-caused warming. Increased temperatures = increased likelihood of fire. But, when you examine disaster-related funding in the last five years, funding directed at wildfires is $13.1 million, while hurricane-related funding totals $480.6 million (this includes grants and in-kind donations). So how can we explain the different levels of support for varying types of natural disasters? Perhaps length of time. Consider the volcano situation that has been occurring for many months in Hawaii. Have you seen companies donating to organizations helping in this area of relief, or, even better, has your company offered a matching program towards this effort? Perhaps not. Some disasters, like wildfires and an active volcano, have a long time frame. It can be longer until you can go into recovery mode, since it isn’t over quickly (and its end can’t be predicted). Whether it is a hurricane or an earthquake, some disasters can happen quickly, and thus be easier to recruit support for immediate recovery and long-term rebuilding. What can we do to better address wildfires? The first step is understanding the impact on these communities: cities and counties will end up paying for at least half of the hundreds of billions of dollars that can go into wildfire recovery in a single year. As the LA Times observes, putting out the fires represents only 9% of the total cost of the wildfire. One group that has witnessed this large burden, and has taken steps to help in the rebuilding efforts, is the legal community. By working with local government bodies and community foundations, legal aid can help to ensure insurance claims are filed correctly, protect local residents from fraud, and more. Claire Solot from the Bigglesworth Foundation in Northern California spoke with me several weeks ago about ongoing recovery efforts from past fires, and with current events I think the information she shared with me could be very beneficial for those asking themselves what they can do. California legal aid organizations have already established exemplary collaborative initiatives based on past fires, which ensures coordinated efforts that are needed in the immediate aftermath of the wildfire are possible. Following the large earthquake in Napa several years ago, five key legal organizations formed the Bay Area Resilience Collaborative, the only organization of its kind in the U.S.. The collaborative works to bring in subject matter experts and provide extensive training for legal aid organizations, among other things. An excellent example of their collaborative efforts is the development of disaster-specific training for lawyers wishing to volunteer, but do not have knowledge of this area. The Legal Aid Association of California (LAAC)developed recordings of trainings so that volunteers were qualified to help. The collaborative then set up hotlines for wildfire victims, coordinating volunteers to staff those phone calls, then connect them to qualified volunteer lawyers. Finally, regional associations like Legal Aid Sonoma County have a physical presence in local assistance centers where they can also disseminate guidebooks and other materials that were developed for victims to educate them on legal vulnerabilities after disaster. The legal aid committee also started a collaborative fund housed at the California Bar Foundation, now California ChangeLawyers, knowing that just because the fire goes out, doesn’t mean the funds should dry up. There is still a long road to recovery. Lawyers can serve as key players in the rebuilding after a wildfire, protecting those that could be victimized. A prime example is housing – as those that need new housing begin to explore options, policies, legislation and ordinances need to be in place to avoid scenarios where rent is increased, or unscrupulous contractors try to take advantage of the desperate. Looking forward, LAAC recently developed a document that details other exposed areas that legal aid can support, including identity theft, wage theft, price-gouging, and domestic violence which can increase after a disaster. The next step in this area is securing funding to support these areas after disaster, and training lawyers so that they are prepared to address these specific kinds of cases. The biggest takeaway from my conversation with Claire is similar to those had around hurricane relief: there is a tremendous need for long term funding for rebuilding, and there needs to be a coordinated approach from local communities when it comes to relief and recovery. However, with some of these disasters that span numerous days, weeks, months, and with hundreds of billions needed to rebuild, other funding sources need to be considered. If we aren’t able to supplement city and county recovery spending, other crucial initiatives could fall behind. For a geographic area to rebuild, they need to physically rebuild homes, reignite the economy with infrastructure reparations, and rehab ecosystems. As fires continue to rage throughout California, I’d encourage you to consider ways you or your employer may be able to help. 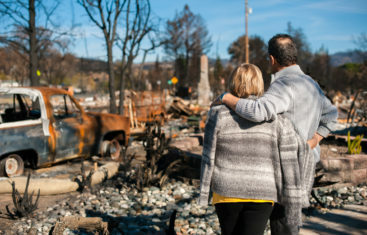 With sometimes no end in sight, it is imperative for local government, community foundations, and legal aid organizations to feel supported to continue to aid their community and protect them from threats that will still exist when the wildfires end. Lessons can be learned from all different types of disasters. The level of collaboration amongst the legal community in Northern California can serve as an excellent model for other areas of the country. The same legal risks exist after other types of disasters, and, as seen in the above example, there are many moving parts for relief that combine discussions with FEMA, volunteer training, and on-the-ground relief and resources. One thing remains the same, and that is the significant cost to rebuild. Without support, it is possible these affected regions could never recover. You can learn more about what you can do to help these efforts from the Center for Disaster Philanthropy. Want to learn more about disaster relief across the sector? Check out Blackbaud's Disaster Relief Resources page.